One of the most underrated competencies in leadership is delegation. As a leader you need to teach people how to think and ask the right questions so that the business can carry on if you’re not around. If you find yourself hoarding work, and working long hours as a result, that may be a classic sign of under-delegating. Confidence in the person you’re delegating to is a big issue – if you don’t believe people are truly able to do the jobs you hired them to do, you may have a bigger problem than a reluctance to delegate. 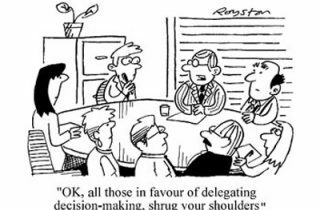 Conversely, good delegation is vital to the development of the subordinates you delegate to. Make delegation part of your process for creating staff development plans. Discuss which types of projects and tasks you will pass on to them so that they can build the skills they need. Give your direct reports permission to tell you when you haven’t delegated something you should. After you delegate, your job as a manager is to observe and support your direct reports, not dictate what they do. “It’s not about making the decisions for them. Develop their critical thinking skills so they become better at intervening in their own situations,” Pfeffer says. Once you’ve started delegating more, pay attention to the results, and learn from your mistakes. “You’re going from a ‘I’m going to do everything because I know better than everyone’ mindset to a ‘I’m going to let people learn’ mindset,” says Pfeffer. It may take time, but the payoff is great. Give us a call on 01865 881056 or email us at info@leaderslab.co.uk if you’d like to discuss any of these ideas in more detail.